It’s about accepting that you can’t know it all. You can ask questions, receive clarification, and redirect. This is good. What is not is jumping to conclusions based on partial information. If you hear part of a conversation and fill in the rest with your own biases, was that really how the conversation went? Part of it is indecisive weakness. If you are too afraid, as a manager, to do what is difficult, it only hurts your team’s morale. I have seen contracts that fully deserve to be canned, yet they keep doing offensive after offensive, without any discipline. Fire and rehire. That is literally your job. I have been a bad employee. I have not done anything overly terrible, but I have screwed up for perhaps all of my career, and have been screwed up on the clock. However, through that, I’ve learned what not to do or say, and now I’d say I’m decent enough to be employable anywhere. Great bosses all have one thing in common. They have confidence. Not just in themselves, but their employees. They can trust that if asked for status, they will receive it, so they know where to guide their ship. They approach a situation not as a disciplinary action, or even a “friendly reminder,” but as a ‘firm but fair’ statement. They are unable to take criticism. I talk directly, do not mince my words, and can admit when I’m unsure. If I have to pretend in a certain way to appraise someone that doesn’t feel comfortable with ambiguity, then I immediately lose respect, though I have learned better than to show it. A manager’s job is to iron out ambiguities. If a manager cannot handle personality quirks, imperfections based on different styles of work, or can only perceive reality based on their own view of it, they should not manage. They are in it for the money, which is fine in lower level positions, but leading a group’s operations? An individual that watches over her or his employees and cannot empathize with even basic concepts also should not manage. This is why I don’t want to be a manager and have complete respect for managers that know what they’re doing and can guide unlike people toward a common goal. Those who can’t… it’s hard to say. Maybe they were good in one role but moved into a role they are not qualified to do. If it’s too much, time to move on out. Sources: My professional experiences, honed through briefly owning a business, which metamorphosed into this website. Inspirations: Brainstorming how it’s like working for good and bad bosses. 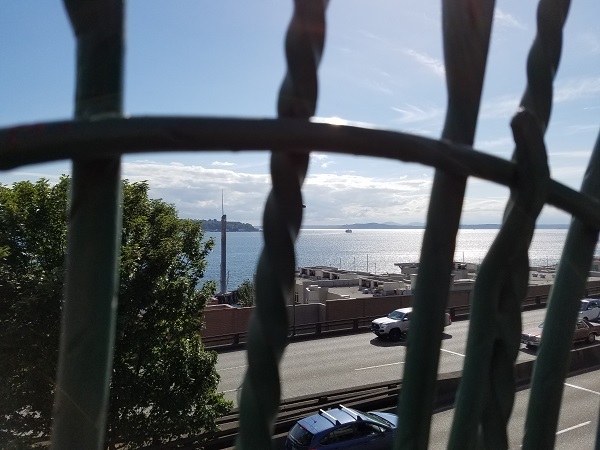 Photo: Looking through some bars at the Victor Steinbrueck Park.